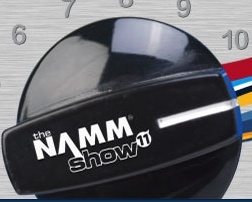 So in case you missed it on the StevieSnacks Facebook Page, I’m at NAMM, in Anaheim CA this week. This post is a recap of the first day. I didn’t take a lot of pictures, but I’ll make up for that later. NAMM is huge. Mind numbingly huge. I was lost within a minute of getting into the exhibit halls. For a first timer at NAMM, my first day was fantastic. Lots of nice people excited to talk about their products. I was able to get some ideas for Rainbow Music, my local guitar store, and even saw a few StevieSnacks fans as well. My first stop was the Premier Builders Guild booth, where I played (for the very first time) a Two Rock amp. These amps are used by John Mayer, so their sound is familiar to me from his recordings. Unsurprisingly, the amp sounded very clean, and very much like what I’ve heard hear on Mayer’s recordings. The guys at the booth were very nice. On the other side of the booth, I got my first look at Fano guitars, built by Dennis Fano. These guitars look like what you’d get if you combined several different guitar brands. The relic details are all hand-done and look fantastic. The fretwork on the guitar I tried was smooth as butter. There were several details about the guitar, (logo carved out of the neck plate, and engraved on the tuners) that gave the guitar a very cohesive look, despite the intentional mis-matched parts it used. Next I stopped by the Pedaltrain booth. I recently purchased two different Pedaltrain boards, which I’ll be reviewing later. The big find for me was a little riser they sell that levels out the pedals on the upper row of your pedal board, making it easier to access the on/off switches. Pretty soon it was time for lunch, and I sat down with Jim Dalrymple (@jdalrymple), owner of The Loop (www.loopinsight.com), a fantastic Mac-focused technology site, and one of the more accurate sources for Mac rumors. I’ve known Jim since this summer, when I found out he watches my lessons. Go figure. Anyway, we had a quick lunch and discussed solutions to various world problems. I will hopefully be contributing content to a music focused section of The Loop in the future. After lunch, I headed to the Avid booth to check out the Eleven Rack to see if it sounded as good as people have claimed. I’ll reserve final judgement until I get a chance to record with it myself, but just from today’s quick demo, it sounds better than any amp plugin I’ve ever heard. Then I stopped by the Rivera booth to try out the Rock Crusher attenuator. I take back every negative thing I’ve said about attenuators in the past. It is possible to make one that doesn’t mash your tone to bits as you turn it down further, and further. But it’s expensive. The Rock Crusher is close to $500. Is it worth it? It just might be if you love your amp, but hate how loud it is. Apparently the technology in the Rock Crusher is quite a bit different from what’s typically used in attenuators, giving it a much more consistent sound regardless of attenuation level. Next stop was Crystal Frets which is exactly what it sounds like. Your inferior metal frets are removed, the fret slots scraped out, and quartz frets installed in their place. They are permanent, do not wear down, and the hardness of the material brings out certain qualities in the notes you don’t get with metal frets. However, this is a radical process, it’s very time consuming, and therefore, very expensive to do. Hopefully, it will find adoption somewhere that will allow mass production of the frets, rather than the one-at-a-time process that must be used now. I ascended the Stairway To Heaven, up to Level 3 of the convention center, occupied by Fender and Gibson, and not much else. The Fender wing was divided into several sections for their different brands/focuses. The Custom Shop stuff was nice to look at, but that’s about it, obviously people aren’t allowed to play that stuff. They had a regular guitar section where I got to try out a John Mayer olympic white strat, and it sounds, and feels great. In the amp section, they had a Fender employee demoing the Mustang amps, and while I’m generally skeptical of modeling amps, I have to say, in the hands of that player, they sounded pretty darn good. After that I stopped by the WattGrinder booth, where I skeptically look at a tiny tube-shaped device that can replace a 12AX7 preamp tube. It’s not a tube….actually I don’t know what it was, they wouldn’t tell me, but I can tell you that when doing a straight comparison between a 12AX7 tube and the Wattgrinder, the Wattgrinder sounded fatter, with possibly more sustain. The inventor claims that the WattGrinder reacts to pedals the same way a tube does, and it increases the dynamic range of your sound. It was too noisy for me to do a proper evaluation, but I hope to review these at some point. My last stop of the say, and my favorite, was the Visual Sound booth. Over 10 years ago, while attending Penn State University, I spent countless hours on a site called the Ampage. It was one of the original gear forums, and the guys on that forum, along with a few priceless websites, taught me nearly everything I know about modifying tube amps and pedals. One of those guys was named R.G. Keen. He had a site called Geofex.com. It was legendary. I spent a ton of time reading his stuff, poring over his schematics, planning, but never actually building, the pedal circuits he had designed. Fast forward about 10 years, when I find out about Visual Sound pedals. It turns out that R.G. Keen is their chief engineer. So when I saw their booth today, it was like meeting one of my college heros. I spoke with R. G. for about 20 minutes and we talked about everything from their pedals, to the role of music in our lives.